Spiraea japonica , var. alpina Maxim. Spiraea japonica is a deciduous, perennial shrub native to Asia that has been introduced to the United States as an ornamental. It aggressively invades disturbed areas and forms dense stands that outcompete native species. 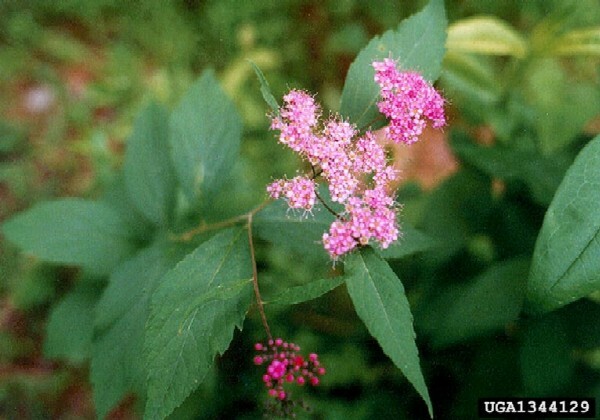 Spiraea japonica is found growing along streams, rivers, forest edges, roadsides and fields. It often spreads locally when its hardy seeds are transported along watercourses and in fill dirt. S. japonica is a deciduous shrub that grows 1.2m to almost 2m in height and about the same in width. It has slender erect stems that are brown to reddish-brown, round in cross-section and sometimes hairy. The leaves are generally an ovate shape about 2.5cm to 7.5cm long, have toothed margins, and alternate along the stem. The seeds measure about 2.5mm in length and are found in small lustrous capsules (Remaley, 1998). Clusters of rosy-pink flowers are found at the tips of the branches (flowers are white to rosy-pink for natural populations native to Asia). S. japonica is naturally variable in form and there are many varieties of it in the horticulture trade. (Nine varieties have been described within the species so far, and southwest China is the center for biodiversity of the species (Zhang et al. 2002). S. japonica has a perennial life cycle, and its seeds can last for many years in the soil (Remaley, 1998). S. japonica is a common ornamental. The tall forms are grown as hedges, low screens, or foundation shrubs and the low-growing forms are used as groundcovers or in borders. The plant has been used as traditional medicine by native people, and extracts from the plants were found to be bioactive (Xiaojiang Hao et al. 2003). A common habitat for this genus in general seems to be in riparian areas, bogs, or other wetland habitats (Ogle 1991).S. japonica is found growing along streams, rivers, forest edges, roadsides, successional fields, and power line right-of-ways. Growing populations will creep into meadows, forest openings, and other sites (Remaley, 1998). According to Scheper (2000), S. japonica prefers full sun but can tolerate partial shade. It prefers lots of water during the growing season but cannot tolerate saturated soils for extended periods of time. S. japonica will grow in a wide variety of soils, including those on the alkaline side, but it prefers a rich, moist loam. A single plant produces hundreds of small seeds that are naturally dispersed (Remaley, 1998). Scheper (2000) states that S. japonica responds well to manure supplements and thrives on organic mulch. Spiraea japonica is a popular ornamental shrub (Remaley, 1998). 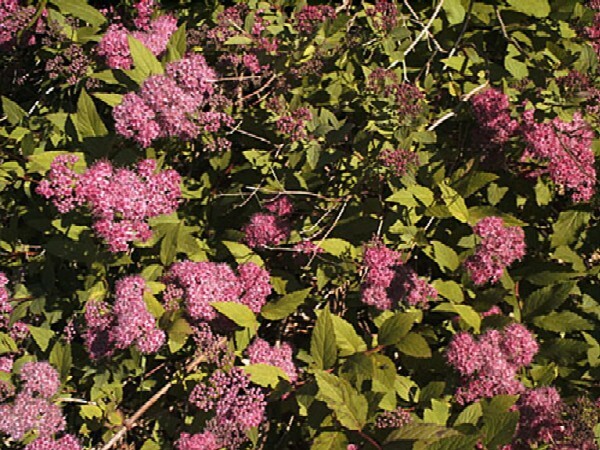 Recommended citation: Global Invasive Species Database (2019) Species profile: Spiraea japonica. Downloaded from http://www.iucngisd.org/gisd/species.php?sc=622 on 22-04-2019. Japanese spirea have become naturalized and occupy habitats similar to those of native spireas (Ogle 1991). S. japonica, according to Remaley (1998), can rapidly take over disturbed areas. Once established, S. japonica grows quickly and forms dense stands that outcompete much of the existing native herbs and shrubs. The seeds can last for many years in the soil, making its control and the restoration of native vegetation especially difficult. Mechanical: Mowing/Cutting: This method is appropriate for small initial populations or environmentally sensitive areas where herbicides cannot be used. 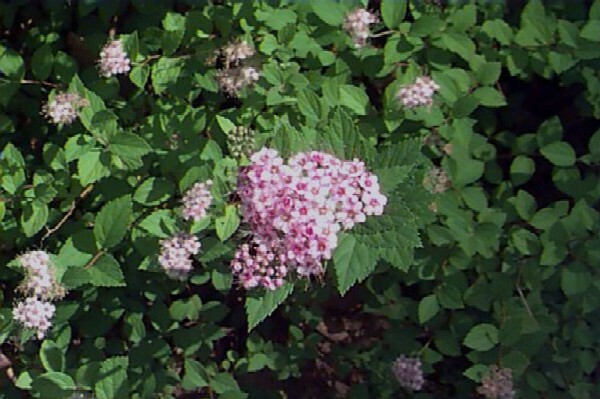 Repeated mowing or cutting will control the spread of spiraea, but it may not eradicate it. Stems should be cut at least once per growing season prior to seed production and as close to ground level as possible. Chemical: Foliar spray options are suitable for large thickets of Japanese spiraea and where risk to non-target species is minimal. Air temperature should be above 18 degrees Celsius or 65 degrees Fahrenheit to ensure absorption of herbicides. Glyphosate and Triclopyr are other herbicides used. Glyphosate is a non-selective systemic herbicide that may kill partially-sprayed non-target plants. Apply a 2% solution of glyphosate and water plus a 0.5% non-ionic surfactant to thoroughly wet all leaves. Triclopyr is a selective herbicide for broadleaf species and can be used where desirable grasses are growing in proximity to the area being sprayed. Apply a 2% solution of triclopyr and water plus a 0.5% non-ionic surfactant to thoroughly wet all leaves. Use a low pressure and coarse spray pattern to reduce spray-drift damage to non-target species. The cut stump method is used when individual plants are being treated, and in cases where foliar application cannot be used. The stems must be cut to the ground and a 25% solution of glyphosate or triclopyr must be applied making sure that the entire surface is covered. Informations on Spiraea japonica has been recorded for the following locations. Click on the name for additional informations. Remaley, Tom 1998. Japanese Spiraea. Plant Conservation Alliance, Alien Plant Working Group. Summary: A report on the description, native range, USA distribution, ecological threat, habitat, reproduction, management, and alternative ornamentals. SE-EPPC (Southeast Exotic pest plant Council), Undated. Japanese Spirea. Summary: Japanese Spiraea profile with management options and ecology. Scheper J. 2000. Spiraea japonica [Online Database] Floridata. Tallahassee, Florida. Summary: A detailed description of Spiraea japonica and briefly mentions distribution, habitat, nutrition, uses, and paths of introduction. USDA-ARS, 2010. Taxon: Centaurea melitensis L. National Genetic Resources Program. Germplasm Resources Information Network. [Online Database] National Germplasm Resources Laboratory, Beltsville, Maryland. Summary: Available from: http://www.ars-grin.gov/cgi-bin/npgs/html/tax_search.pl?centaurea+melitensis [Accessed June 15 2010]. USDA-NRCS (Natural Resource Conservation Service). 2005. Spiraea japonica. The PLANTS Database Version 3.5 [Online Database] National Plant Data Center, Baton Rouge, LA. U.S. Fish and Wildlife Service, 1992. Virginia Spiraea (Spiraea virginiana Britton) Recovery Plan. Newton Corner, Massachusetts. 47 pp..
Summary: An account of a recovery plan of a native spiraea, Spiraea virginiana.